Another writing project takes my attention away from the blog. This winter is different from previous ones because I’m not going to my day job. I feel as if I’ve been given the gift of time–to sleep, to let my joints and tendons recuperate from summer fieldwork, to be unashamedly idle. Lyanda Lynn Haupt has written about Idle Pleasures on her blog The Tangled Nest. For me, these include reading, knitting, sewing, listening to radio programs, cooking complex recipes, staring out the window, hanging out with friends. Idle Pleasures are my reward for writing at least 1000 words a day on what I hope turns into a book. The days are gray and ice-foggy again, so I turn to my scrap box for a splash of color. I’m piecing quilts. The one in the photo is coming together after years of languishing. One time I found a bag of vintage fabric scraps at a yard sale, and that sent me hunting for more. I collected them from second hand shops, and found contemporary reproductions. They remind me of my grandmothers, who were both quilters and savers of scraps. As a little kid, my artist’s eye was entranced by the colors and patterns, and boxes of material held unlimited potential as far as I was concerned. I learned to sew in my teens and started my own collection of quilt scraps before I even had a permanent place to live. Leftovers from cutting out a pair of pajamas, sundress or flannel shirt followed me from place to place. I used to buy blank composition books for my journals and cover them with colorful fabric. Sometimes I buy a quarter yard of fabric just because I like it. And I inherited some of my gramma’s stash. So my collection has grown, and I’ve pared it back some by giving bags away. Because of the gift of time, I’m diving into the box and discovering the potential. How this piece could go with that, how an accumulation of pieces can come together in a handsome warm covering. It’s the same with the writing. Scraps of experience carried for years are pieced together in a pattern. I won’t know how the whole thing will come out because I haven’t stitched together enough blocks yet. In the course of daily writing, I’ve learned to drop my expectations of how the process ought to go. I’m not a linear thinker. Things do not appear fully formed in my imagination. I only get the starting point. It’s all about the exploration and figuring out. It helps to be curious and willing to play. It’s necessary to trust the creative process and follow it. Out of all these pieces, wholeness is possible. I truly believe that. 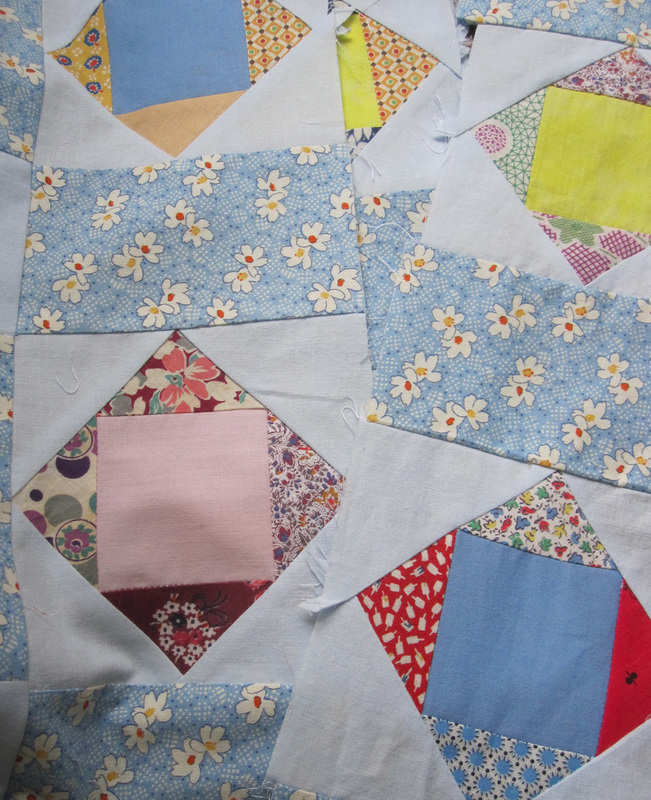 Deb, I love this image of quilting together scraps, pieces of experience. I agree that wholeness — beautiful amazing wholeness — is possible and wonder too if the pieces are already in and of themselves whole! Hurrah for non-linear thinkers! I love what the wandering mind creates.